Ashley Wagner reacts after skating at the 2015 Prudential U.S. Figure Skating Championships at Greensboro Coliseum on Saturday in Greensboro, North Carolina. Wagner also became the oldest skater to take home the women’s title since Michelle Kwan in 2005 and the first woman since Kwan to win three U.S. championships. It’s unrealistic that Wagner, at age 23, will match Kwan’s nine titles, but Saturday’s record-busting effort was especially satisfying for the outspoken skater, who thinks she has a lot to prove. Wagner is perhaps best known for inconsistency. She fell twice during her messy free skate at last year’s nationals but still made the U.S. Olympic team over a higher-scoring competitor, Mirai Nagasu. Many were quick to deride that controversial decision, although U.S. Figure Skating stood by its choice, citing Wagner’s international experience. She finished seventh in Sochi. So, how did Wagner get to tip-top of the heap in 2015? Sure, keeping her backside off the ice helped, but she also upped her difficulty level and refined her performance. In the chart below, I’ve plotted several elements of Wagner’s 2014 and 2015 free skates. Because a program’s components differ from year to year, this isn’t a perfect measure; I did not include some elements, and others I matched the best I could. 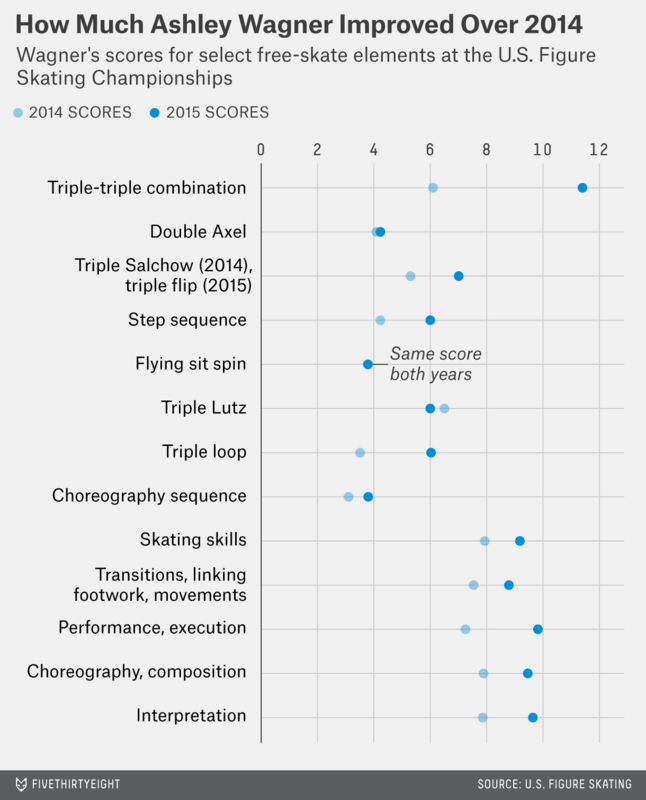 For example, in 2014 Wagner’s triple-triple combination (traditionally the most difficult part of a women’s program) was an under-rotated triple flip-triple toe loop, and in 2015 it was the trickier triple Lutz-triple toe loop. In 2014, she performed a triple Salchow; in 2015, a triple flip. Almost across the board, Wagner scored much, much higher. Last year, Mao Asada of Japan won her world title with a total score of 216.69. If Wagner can repeat Saturday’s performance in March — and some might argue that’s a big if — she could easily win her first world championship medal. In gold.